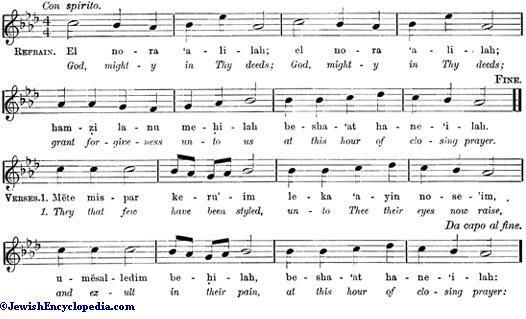 - Phrase search: "names of god"
The most high God (Gen. xix. 18-20, 22, A. V.; R. V. "God most high"), as whose priest Melchizedek blesses Abraham (compare "Urusalem," in the El-Amarna tablets; Schrader, "K. B." iv. 180, 25 et seq. ; 183, 14; 185). He is further characterized as the "possessor [or "creator"] of heaven and earth" (Gen. xiv. 19). 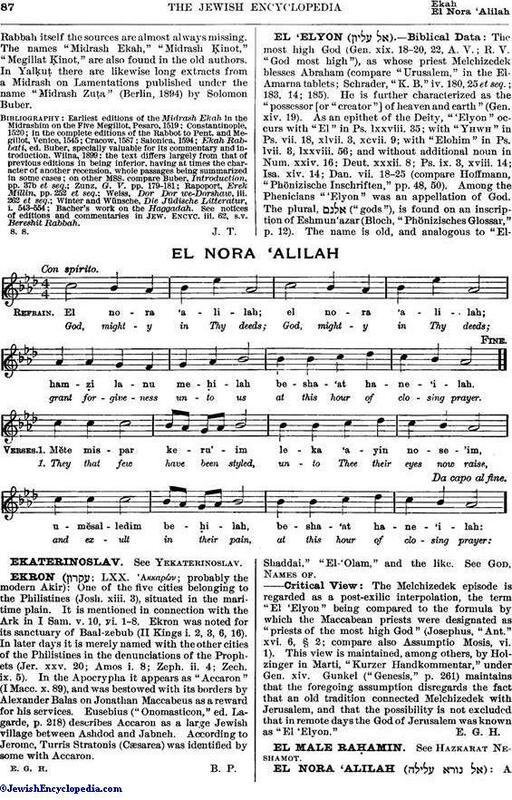 As an epithet of the Deity, "'Elyon" occurs with "El", in Ps. lxxviii. 35; with "Yhwh" in Ps. vii. 18, xlvii. 3, xcvii. 9; with "Elohim" in Ps. lvii. 3, lxxviii. 56; and without additional noun in Num. xxiv. 16; Deut. xxxii. 8; Ps. ix. 3, xviii. 14; Isa. xiv. 14; Dan. vii. 18-25 (compare Hoffmann, "Phönizische Inschriften," pp.48, 50). Among the Phenicians "'Elyon" was an appellation of God. The plural, ("gods"), is found on an inscription of Eshmun'azar (Bloch, "Phönizisches Glossar," p. 12). The name is old, and analogous to "El-Shaddai," "El-'Olam," and the like. See God, Names of. The Melchizedek episode is regarded as a post-exilic interpolation, the term "El 'Elyon" being compared to the formula by which the Maccabean priests were designated as "priests of the most high God" (Josephus, "Ant." xvi. 6, §, 2; compare also Assumptio Mosis, vi. 1). This view is maintained, among others, by Holzinger in Marti, "Kurzer Handkommentar," under Gen. xiv. Gunkel ("Genesis," p. 261) maintains that the foregoing assumption disregards the fact that an old tradition connected Melchizedek with Jerusalem, and that the possibility is not excluded that in remote days the God of Jerusalem was known as "El 'Elyon."